First things first, Lan Diep is my hero. And not just because he has a working Ghostbuster ghost trap. 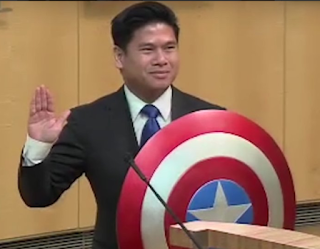 Lan won a seat on San Jose’s city council running as an independent and does take the office position seriously, but he also understands the necessity of introducing some humor into modern politics (which we can all agree has become a gloomy place). Well done Lan and wishing you the best in your new role as Councilman! You can follow him on Twitter @LTDiep. Update: On Feb 2nd 2017 Comedy Central aired a portion of Lan’s swearing in on @Midnight with Chris Hardwick . If you could be sworn in with any superhero weapon, what would you choose? Previous Saturday Night Fun with Little G-Man!